The movement against unpaid internships took on a new set of tactics Friday, as students and interns in Montreal staged a one-day strike demanding remuneration for all internships in the province. Striking students and their supporters staged a demonstration in front of the Ministry of Labour. Nov. 10, when the strike took place, was designated as International Interns’ Day by a coalition of European-based organizations. Groups from all over the world, including Montreal, staged coordinated protests and actions. In Montreal, seven student associations went on strike for the day, mostly based out of Université du Québec à Montréal. No Concordia-based associations were on strike, but some showed up to the demonstration in support. 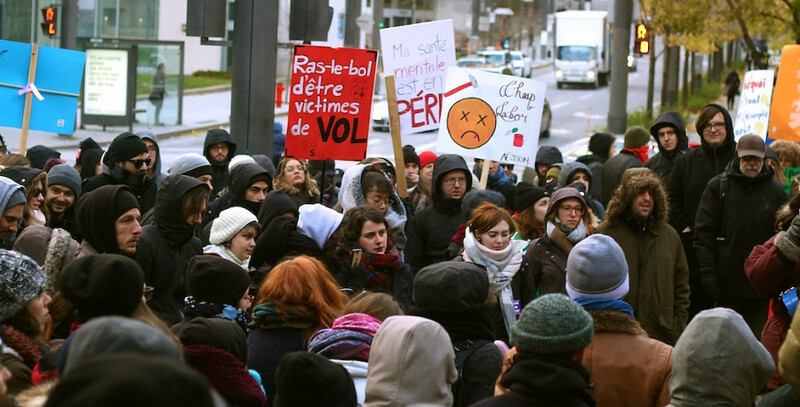 Striking associations included the social work and education departments of UQAM, both of which require unpaid internships as part of the program. 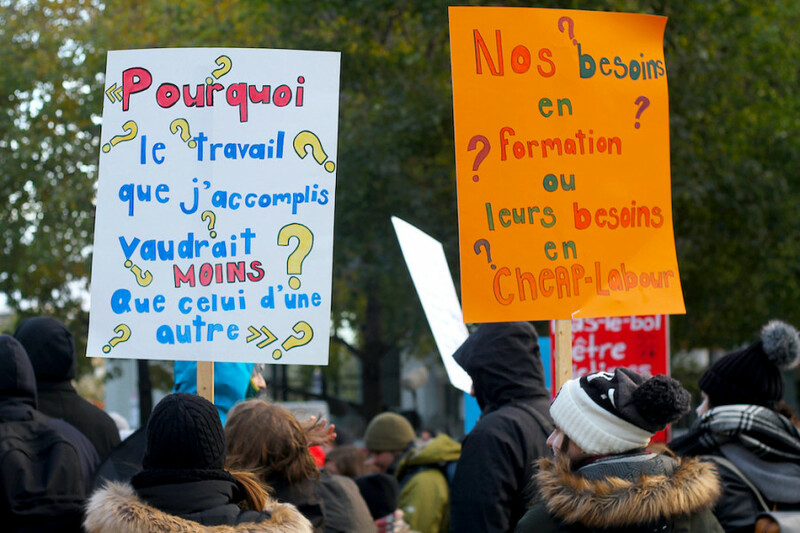 Alice Lefevre, a fourth-year student in social work at UQAM and spokesperson for the Coalition montréalaise pour la rémunération des stages, said that she sees the strike as being an unprecedented mobilization for the departments involved. Having been implicated in the student movement since 2012, she said that in her experience, the departments which went on strike on Nov. 10 have historically been more hesitant to protest. Organizations based out of Concordia were also present at the demonstration, despite not being on strike. Ahmed Badr, the external and mobilization coordinator for the Concordia Student Union, showed up in support. The CSU is currently beginning its annual campaign, which will focus on opposing unpaid internships. Badr says that the CSU is collaborating with the Association for the Voice for Education in Quebec, a provincial federation of student associations of which the CSU is a member, to collect data on unpaid internships at Concordia, in the hopes of using that data to pressure the Concordia administration to adopt paid internships for all students. This, he said, could include removing the regulations that require students in certain programs to take unpaid internships. AVEQ has also taken on a mandate against unpaid internships, and works to put pressure on the provincial government on the issue. The federation is also collecting data on unpaid internships in universities across the province. Kristen Perry, AVEQ’s mobilization coordinator, said that she specifically hopes that the provincial government will retract a clause in Quebec’s labour code that exempts interns from protections granted to other workers. She said that there are “many layers of policy” to go through to end unpaid internships, including provincial laws and internal regulations at universities. The demonstration in Montreal stayed in Square Victoria, where the crowd heard speeches from representatives of various groups fighting against unpaid internships. Many of the UQAM students present, including Lefevre, had spent the day holding picket lines to enforce their strike mandates. According to Pierre Luc Junet, who organizes with the Comité unitaire sur le travail étudient at Concordia, Montreal was the only city in the world where interns went on strike for this International Interns’ Day. He said that, he sees the issue of unpaid internships evolving into a major social movement over time.